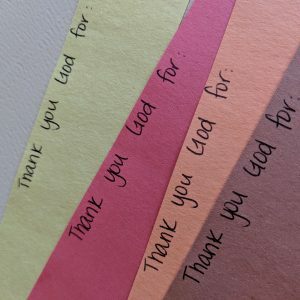 November is quickly approaching and along with it a unique opportunity to teach our children the skill of being thankful. This is something we can and should be teaching our children daily, but I want to be intentional going into this season with my children in a fun and tangible way. I have three little boys, ages 5, 3 and 2. We are also expecting our fourth blessing in the month of November, which makes these upcoming weeks that much sweeter for our family. 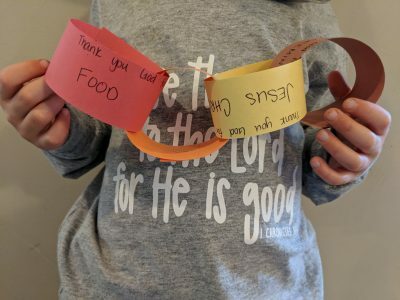 The idea is simple – paper chains and a daily prompt. Some prompts will get them thinking. Some are simple. 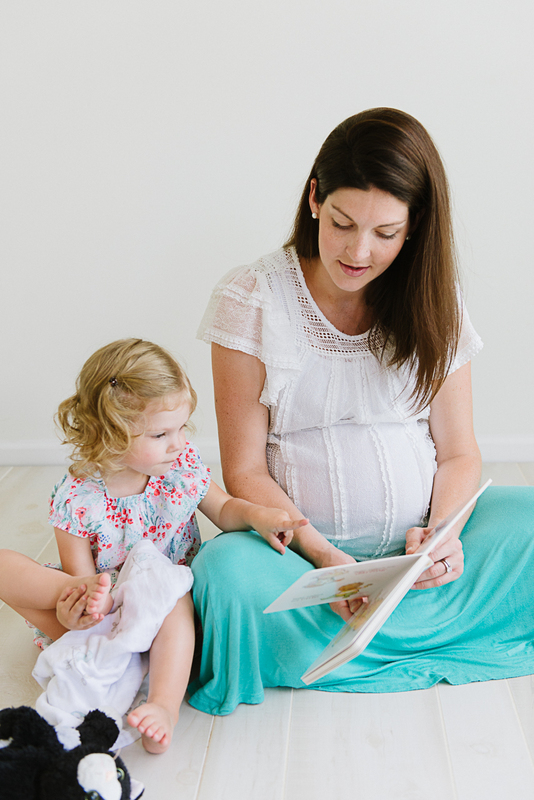 My prompts are geared toward preschoolers, but you could easily gear your prompts towards older children or yourself. 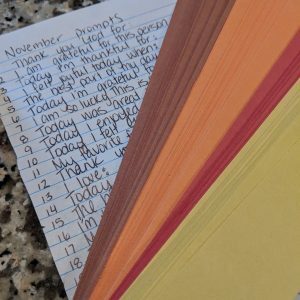 You can Google “Ann Voskamp’s 1000 gifts” or “gratitude journal” for ideas. Or you could use the same prompt every day. My boys are little and most days I expect to get one word answers, but I can almost guarantee some of their answers are going to have us laughing and leave me dumbfounded on how to point them to Jesus. But their answers will give me a glimpse into each of their precious hearts and what they hold dear. 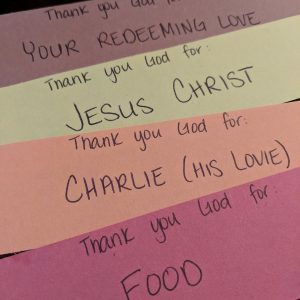 I plan to use those answers to point them to Jesus and who those blessings come from. And I will trust that the seeds that are being planted during this season will one day reap a harvest. For example: “My favorite color is ___” can open up a conversation about why we should be thankful to God for the many colors he created. Colors are one way we can visibly see His majesty! My prayer is to have them reflect, daily, on all that we have to be thankful for. We are so blessed by Christ. In so many little ways that we can overlook if we aren’t searching for him. Even at a young age, I want their eyes to be open to God’s goodness, His mercy, and His grace. I want them to stand at His feet and marvel at who He is and what He has done for His people. 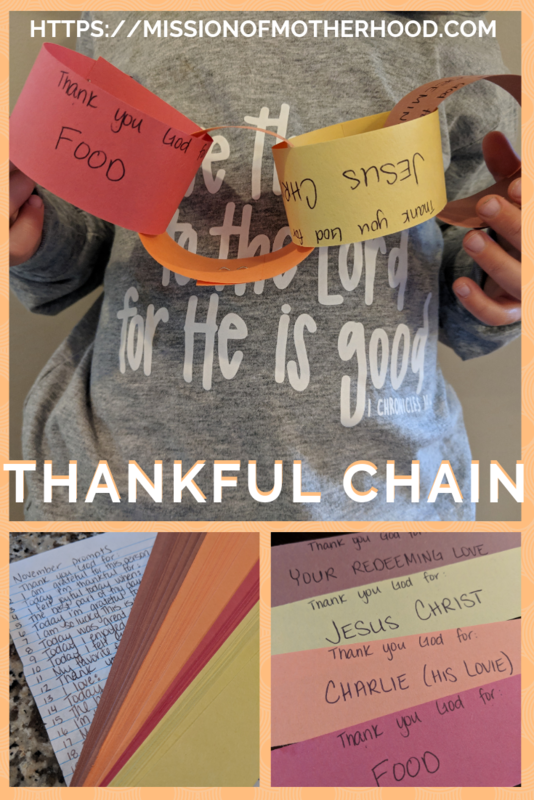 And as the month progresses, they will be able to visibly see their chain grow and be able to count all the ways God has blessed us as a family. May they always have thankful hearts! How are you finding ways to model an attitude of gratitude for your children? How can you modify this activity for older or younger children? Leave a comment and let us know!